Hot Chocolate Bundt Cake - What the Forks for Dinner? 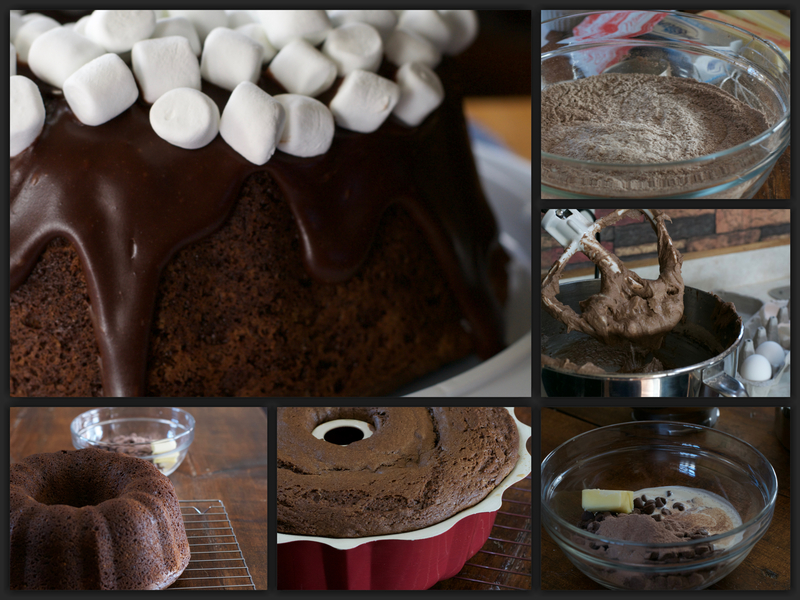 This is a real quick post for a fabulous winter cake………… Hot Chocolate Bundt Cake! It was #cake monday…….only on a Tuesday cause of MLK Day. I was fresh out of ideas for my cake contribution, until I came across recipes on Pinterest for Hot Chocolate Bundt Cake. 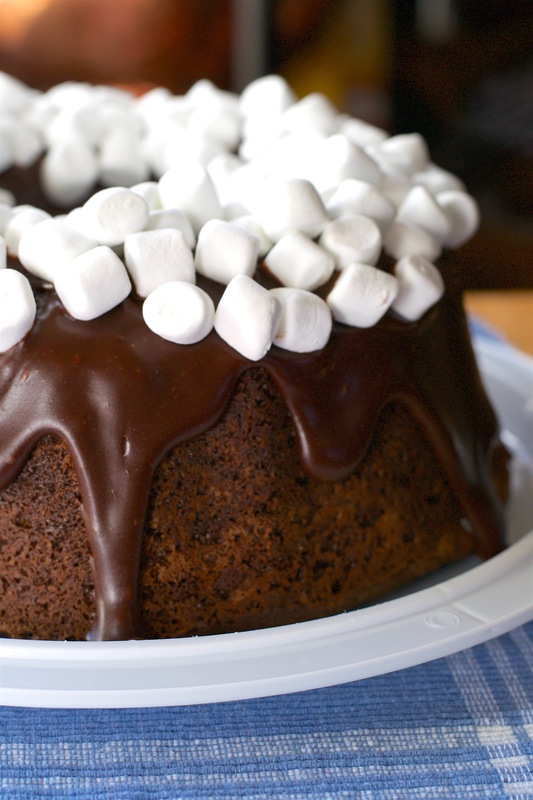 There are quite a few recipes for this cake, but the one from Cookie and Cups is perfect. I used the recipe without any changes. So thank you Cookies and Cups! This cake is dense, chocolatey and really does taste like hot chocolate. The marshmallows are the perfect decoration and taste. 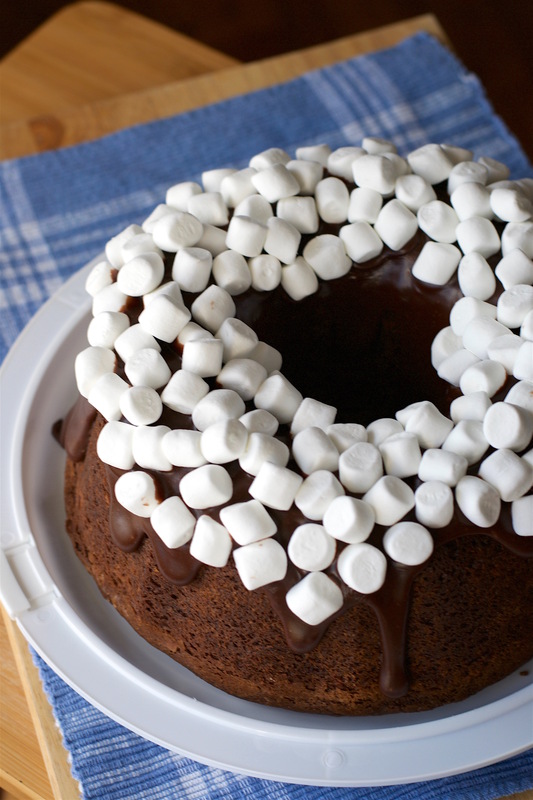 So, on your next snowy, cold, cake monday ………or any day, try a Hot Chocolate Bundt Cake! Spray 10″ bundt pan with non-stick cooking spray. Cream together you butter and cream cheese until smooth. Add in sugar and beat on medium about 2 minutes until light and fluffy. In microwave safe bowl, melt milk chocolate. Add to butter mixture and mix until well blended. Slowly add in your sifted dry ingredients. In small saucepan over low heat melt milk chocolate, 2 tablespoons dry hot chocolate mix, heavy cream and butter together until melted, stirring frequently.